This guide will show you everything you need to know about performing a competitor analysis. You’re going to reverse engineer the marketing playbooks of all your competition. We’re going to use RevZilla.com—an online motorcycle-gear retailer—as our test subject. To get a solid understanding of the competitive landscape, we’d ideally perform an analysis on 3-5 of the top performers. The tools listed below could easily run you over $600 / month, but there is overlap. You could drop SimilarWeb out of the mix – as SEMrush and Ahrefs can pull a lot of similar data. And between trial sign-ups and month-long engagements, you could get all of your research done in a week or two. Here are 19 tactics for you to try. First, we’ll plug the site into SimilarWeb. SimilarWeb is a market intelligence platform that pulls in data from hundreds of millions of desktop/mobile devices, partners with millions of subscribers, public data sources from over a billion sites and app pages, and from hundreds of thousands of sites and apps. SimilarWeb delivers a breakdown of Revzilla based on its many sources of data. Scroll down further, and we get a traffic overview including referrals, search breakdown, social traffic and display advertising. Dig a little deeper, and you get a website content report, audience interests, and a listing of competitors & similar sites. We use SEMrush a lot here. It’s a competitive intelligence suite that I use almost daily for keyword and ranking research. Next, I’ll drop RevZilla.com into SEMrush’s main dashboard. The ‘Organic Search Positions’ report shows RevZilla pulling in traffic from 305,930 keyword terms from Google’s top 100 organic search results and the keywords it is ranking for. By applying some advanced filters, we can narrow down the search results to a keyword list that’s more workable. ‘Exclude’ + ‘Keyword’ + ‘Containing’ = ‘revzilla’ – to remove all branded search terms. ‘Include’ + ‘Pos.’ + ‘Less Than’ = ’21’ – to filter out all keywords on the third page of Google and beyond. ‘Include’ + ‘Volume’ + ‘Greater Than’ = ‘100’ – to filter out terms with lower search volumes. You still end up with a keyword list of 39,629 terms so you’ll have to get creative and add additional filters to refine the results. While we’re still in SEMrush – we’ll now go and uncover their most heavily visited pages. The Pages report lets us know that the top 8 most visited pages bring in 25% of the site’s search traffic. 10.62% of their search traffic lands on the homepage via 1664 different keyword terms. You can then click on each page and perform in-depth research on each result. Now over to Buzzsumo do see which content is working best on social media. If you’re not familiar with the Buzzsumo platform – it allows you to analyze what content performs best for any topic or competitor. First, we’ll start with ‘Most Shared‘ to view the absolute most successful pages on the site. This report gives us a sense of what has gone viral or captured the hearts and minds of their visitors. Indian built the bike Lemmy asked for, but is it real? What is the Motorcycle Advisory Council and how will it affect us? ‘What‘ articles give the reader more information on a specific topic, which will often involve comparison type posts. ‘Why‘ articles provide readers with a reason or purpose and details that support a focused conclusion. A Buzzsumo study concluded that ‘what‘ and ‘why‘ are the two of the top five ‘starting words’ in the headlines of successful B2B headlines. Next, we’ll calculate the [average] content length of their top posts. This will help us determine the word-count we’ll need to match and beat the top performing posts. One free tool I often use is Bulk Web Page Word Count Checker, a handy tool created by Jasja ter Horst that lives on his SEO Review Tools site. You can submit up to 10 URLs and the tool will automatically extract all the text/content inside the HTML body tag for every single page. BWPWCC also averages out all of the word counts by default. This is useful if you’ve inputted 10 URLs from the same category (such as blog posts). This will give you a target to aim for when you research and create your content. Buzzsumo will also give you article word counts with a paid account. We’re going to look at ‘Alt Text Tags‘ to see if they’ve paired any clever alternate keyword phrases with their images. ‘The ALT tag adds a text description to an image on a Web page and should be used for all images, graphical bullets, and graphical horizontal rules. The alt text within the ALT tag should let the user know what an image’s content and purpose are. Go to one of your competitor’s blog posts or landing pages. Right-click anywhere on the page and then click on ‘View page source‘ in the pop-up box. Alternately type ‘Ctrl’ + ‘U’ to view the source code of the web page. Enter ‘alt=’ into the search box. Now you can scan the page for all the Alt tags which will be highlighted in yellow. Make a note of the text contained within quotations. Are they simply copying model names or keyword phrases, or are they attempting to input different variations? WHOis.net will tell you how long your competitors have been in business, the date they registered their domain, their contact information, server statistics and more. You can perform a domain whois search, whois IP lookup and search the whois database for relevant information on domain registration and availability. WHOis can help provide insight into a domain’s history and additional information. See who owns a domain name, how many pages from a site are listed with Google and search WhoIs address listings for a website’s owner. Determine the proper contact for any domain listed in the Whois database. Now we’ll use Ahrefs to find the site’s most linked to content. The site’s 974,750 pages are now re-ordered by backlink count. Depending on which paid tier of Ahrefs you’re on, you can get very granular with these reports. You’ll probably want to dig around on both their E-comm pages and blog posts to see which type of content is pulling in the most links and where those links are coming from. Back over to SEMrush to explore all of Revzilla’s Google Ad campaigns. In the ‘Paid Search’ section, you will find visual information related to the domain’s paid traffic and its cost, ad copies, keywords that the domain appears within Google’s paid search results, keywords ranking distribution, and the domain’s paid competitors. SEMrush is estimating that Revzilla is pulling in 96,000 visitors a month via 16,000 paid keyword terms. Let’s uncover their campaigns. At the bottom of each ad you’ll notice a ‘keyword #‘ indicator. The first ad result ‘Shop Motorcycle Helmets – Shop by Color‘ is triggered by 77 different keyword search phrases. Export the report as a CSV file. Import it into a new Google Sheet. This sorts the ads into four columns – Title, Description, Visible Url and (destination) Url. Alternately you should also click on the ‘Paid Search Positions‘ report. The PSP report shows positions the queried domain is getting in Google’s paid search results and the keywords ranking positions. Export the paid search positions report as a CSV file. Import the data into a new Google Sheet. Now you can scan your report for keyword clusters. Not only are these valuable keyword phrases to possibly use in your content and copy. They’re valuable enough terms to pay for! I won’t dive too much deeper here – as this article is covering competitive research, not keyword research. But you see how things quickly overlap. For Revzilla’s ‘2017 Best Motorcycle Helmets – RevZilla’s Top Picks for 2017‘ ad they’ve input 15 different phrases. So how’d you like access to the world’s largest swipe file of Facebook ads??? The good news is that you’ve already got it. And it’s free! Go to the Facebook page of any business – in this case, Revzilla’s. Choose a country if applicable. Have hours of fun pouring through the FB ads of your top competitors in any industry. Make a *visual swipe file* of all of their Facebook and Twitter ads in Google Docs or similar. Check back periodically to see which ads they’re running consistently. If you track this over weeks and months – you’ll know which ones are working if they keep running them. Now let’s do the same for Twitter. Head over to their Ads Transparency Center and enter any business Twitter handle into the search box. If the company has run any ads in the past seven days – they will be listed in the results. With Adbeat, advertisers can see what direct competitors are doing and how they’re doing it. Besides just seeing ads and the messaging being used, they’re also able to show you the sources of traffic including how the media was purchased and what publishers the ads were running on. Adbeat delivers us all of the ‘Standard Ads,’ ‘Native Ads,’ ‘Video Ads‘ and ‘Landing Pages‘ that it can locate. Now your ad swipe file is growing by epic proportions. I’m a huge fan of using Followerwonk to analyze both a competitor’s followers and who they are following. To make things more interesting, I’m using the ‘Compare Users‘ report. I’ve entered the Twitter handle of one of RevZilla’s main competitors—in this case, Motosport—to see how much overlap there is. From here I click on ‘followers of Revzilla’ and download the CSV file for later sorting. If I were looking to build out a huge Twitter list to put a sponsored post in front of – I’d also grab the ‘followers of MotoSportInc‘ and ‘followers of both’ lists. You can analyze individual Facebook pages in Buzzsumo. Enter the name of the page you would like to analyze. Buzzsumo will show you the posts from this page that have gotten the most engagement. Analysis and list views are also available for FB pages. The analysis section gives you a helpful rank of the performance of the page compared to others in its category on Facebook. Dissect the landing pages that you end up on. Sign up for their email and newsletter lists and make a swipe file of their sequences. Use Feedly to subscribe to their blog. Feedly is a news aggregator app for various web browsers and mobile devices running iOS and Android. Feedly is pretty good at estimating how often a site publishes content. We’ve already mentioned dissecting a competitor’s landing pages. Here’s how to do that. Take a “full screenshot” of their landing pages so that you can mark them up with your notes. With the Chrome extension Full Page Screen Capture, you can capture a screenshot of a web page in entirety. While on the target page in your current browser window. I’ll use Revzilla’s ‘adventure touring’ [ADV] category page as an example here. I save the .PNG file that Full Page Screen Capture outputs to a folder. Then it’s over to Adobe Creative Cloud—specifically Photoshop and Illustrator—to mark up the landing page with notes, scrawls and comments. The BuiltWith Chrome extension will uncover what plugins, tracking software and content framework they’ve built their site on. You can also use Wappalyzer or Whatruns to perform the same tasks as BuiltWith. Wappalyzer is a cross-platform utility that uncovers the technologies used on websites. It detects content management systems, e-commerce platforms, web frameworks, server software, analytics tools and many more. If your competition has an active presence on YouTube, then you’ll want to sign up for TubeBuddy’s channel management browser plugin. We’re going to make heavy use of its ‘View and Copy Video Tags‘ function. Reveal what your competitor is tagging their videos with. Look for ideas around what tags to use in your videos. See why particular videos are rankings higher in search results. If you’re inputting all of the tags into a spreadsheet, click on the ‘Copy To…’ box. Or build ‘Tag Lists‘ within TubeBuddy. Use “reddit.com/domain/yourdomain.com/” [replace ‘yourdomain’ with your target URL] to find where your site (or your competitor) has been shared or mentioned on Reddit. This tactic is excellent for finding subreddits to promote your content on, feedback on your company, and questions that need answering. I saved one of the best tactics for last. Here, we’ll mine Amazon (or Google or Facebook) reviews and build out an immense text document with large clusters of customer feedback. Once your document is cleaned up, we’ll drop it into an Ngram analyzer to find multiple occurrences of bi, tri, 4, and 5 grams. If you happen to be working in E-commerce, Amazon can be a great place to find powerful consumer feedback on products. In this case, Revzilla doesn’t ship products through Amazon, but you could head over to ResellerRatings to find a gold mine of over 97,000 reviews. If Amazon does turn up pages of reviews, you can start building out your mined review document by mass cutting and pasting. If you want to do it faster – you could scrape the product reviews in Python, Pip, with several packages. Actually that sounds a little daunting. 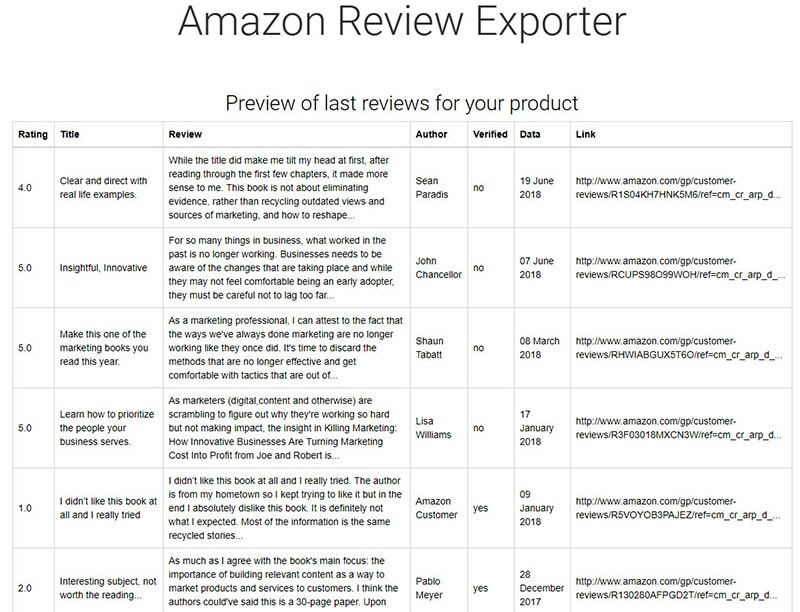 Luckily, Feedcheck built an Amazon Review Exporter for the 99.8% of us who don’t know how to scrape AZ reviews with Python. They give the first ten reviews for free and charge $39 for each complete job. $39 per product could add up fast. If it’s not in your budget, copy the rough layout you see above into Google Docs using the ‘Insert Table’ function and do a bunch of cutting and pasting by hand for smaller review mining projects. Full credit to Wil Reynolds and SEER for this tactic. Before you do anything else – talk to your customers. And talk to your competitor’s customers. Set-up one on one phone calls or meetings. And when I say, ‘talk to them’ I mean listen. Founder of Massive Kontent. Obsessed with Authority Building Content since 2008. What is it About Logo Graphics and Why Do We Love Them?